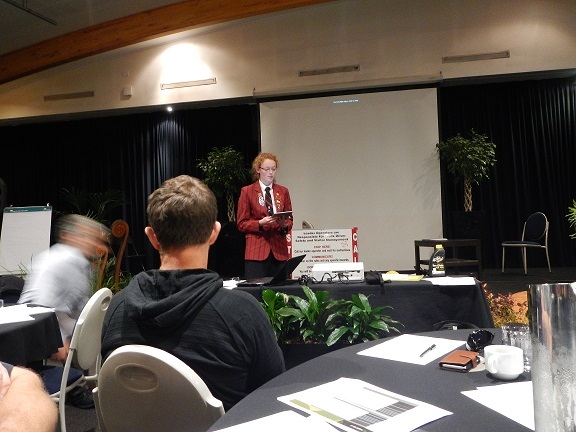 The first training event for the Environmental Advocates (an initiative similar to the successful Safety Champions programme) was held in August at the Rydges Hotel, Rotorua, for the contractors and staff based out of the Rotorua office. The day was attended by a total of 80 staff and contractors. The morning session included presentations by Drs Mike Joy, John Leathwick, and John Craig, all well respected researchers and academics in the fields of water quality, forest ecosystems and threatened species. They provided a captivating and confronting ‘big picture’ overview of the threats facing our natural resources and ecosystems. The afternoon programme included a presentation by Worksafe on the new HSNO Toolbox, a role play acted out by several steely PF Olsen staff members, and further elaboration on the role of the Advocates. Six environmental awards were presented to members of three contractor crews in recognition of the care taken around archaeological sites and a riparian area. Congratulations to award recipients Gaddum Construction, Blackhawk Logging and Bay Yarding. The last word of the day was a perspective on ‘why we should care about the environment’ from year 12 student Loren Skudder-Hill from John Paul College. Loren was one of ten NZ representatives that attended the Australian Model United Nations conference in 2014. She was a recipient of the prestigious International Diana Award, awarded to young people across the globe who are committed to helping others. Loren also participated in the Sir Peter Blake Youth Enviro-Leaders’ Forum in April this year. Loren’s finishing address provided a fitting end to a full and interesting day. PF Olsen’s Environmental Manager, Kit Richards, said the core purpose of the programme was to engender a greater sense of understanding and ‘caring’ for the environment. Feedback from the participants clearly indicate this first course has well and truly hit the mark, and the PF Olsen environmental team is now looking to rolling out the training more widely.